Absence may be just as important as presence—search for where files are NOT coded at a particular node and ask why. 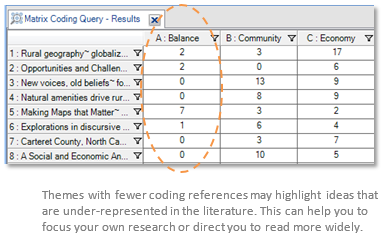 If you have classified the literature and assigned attributes (like author and publication date), you can use queries to do more targeted analysis—for example, you could create a chart to check the spread of your literature files—is a particular author or institution over-represented, should you review a wider range of literature files? Import administrative items related to your respondents—like consent forms or email conversations. You can code these items at the case for a respondent, and use a Group query to quickly list all the material related to a particular respondent. 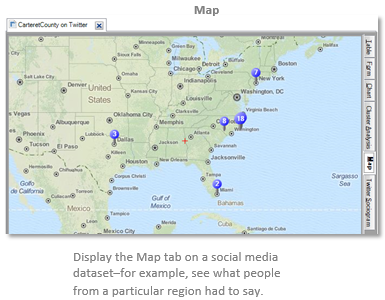 Copy visualizations (like charts, maps and diagrams) and paste them into your report or presentation. You can also export a visualization as an image file or copy and paste it as a picture in NVivo. 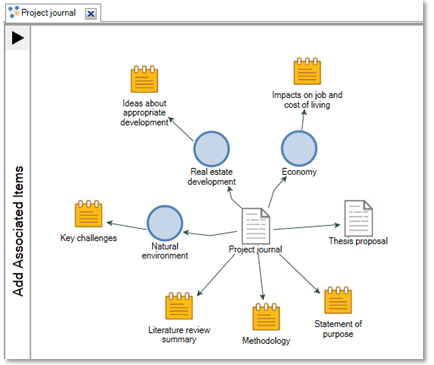 If you have a project journal that describes your path through the project, you can use it to create a project map. Keep this nearby as you write—double-click on a project item to easily access related information.